You’ll never have a still enough day to see it quite that way, but the Potomac River is a mirror. On one side, the C&O Canal Towpath, ranging from sandy with a few puddles to vast, flat and smooth, all the way to Cumberland. Across the span, however, you’ll find the opposite — rugged, rocky and halting. The Potomac Heritage Trail. The name means a lot of things — primarily a network of trails flanking the river between the Potomac and Ohio river basins — but in D.C., it means the towpath’s sinister sibling. Its trailhead alone lets you know you’re in for something a little edgy and dangerous. From the Teddy Roosevelt Island parking lot, it skulks over in the corner, like it’s hanging out with older guys on the edge of the playground eyeing up a pack of Kools one of them found in the street. If you’re looking for an easy run, you’d be wise to listen. For the sake of the experience and to quench my curiosity about the trail I’ve only run in pieces, I’m going on. It starts out pleasantly enough, single track down along the river. It’s more in tune with the Potomac than the towpath. Rocky portions pop up intermittently, but they’re runnable. There’s a way onto Donaldson’s Run and Potomac Overlook Park, another way onto the trail, off of Military Road in Arlington. After two miles, the ground changes, and I ask nobody in particular if they’d like some trail with their rocks. As usual, nobody laughs, but this time it’s because there’s nobody else out here. It seems like a good place to run if you have a grudge against your ankles. The scant number of hikers (three) have now surpassed the even-scanter number of runners (two) on the trail, a strong suggestion that I should be doing the former. For a road-centric runner such as myself, I need to tie myself down to whatever chair I’m sitting in, because this section is going to be a rough…ride, to paraphrase a former local college student. If I was training for, say, the JFK 50 Mile, I’d mark this stretch on the map and head back frequently. Approaching the Chain Bridge, it’s easy to miss the trail’s left turn, and doing so meant even more rocks and a somewhat-perilous creek crossing, when temperatures dipped to the point where soaking wet shoes would become a problem. I only realized where I went wrong when I met back up with the trail and saw where I went wrong. After the Chain Bridge, roughly four miles in, which you can cross beneath or on top of the bridge and then over to a parking lot to pick up the trail again, the choice presents itself to go straight ahead and jump on the Pimmit Run Trail into McLean or turn right, cross Pimmit Run, and head toward Fort Marcy. Proceed. I found the rocks and relative flatness replaced by smoother, muddier hills. 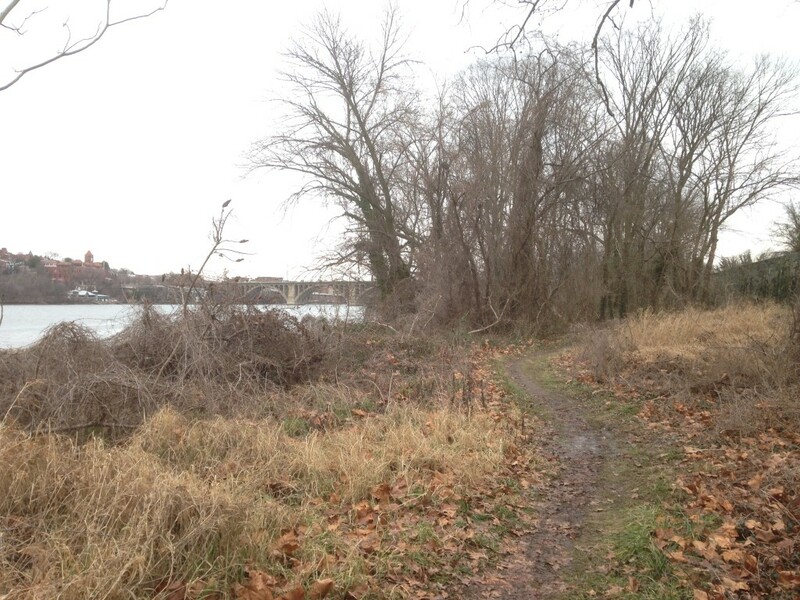 Emerging into Fort Marcy, head toward the George Washington Parkway to pick up the trail, marked by green blazes. The trail follows the parkway for a while, and I’m conflicted. If someone asked me what road I’d want to close to traffic so I could have carte blanche for running, I’d say the length of the Parkway between Rosslyn and the Beltway, no hesitation. So while I should relish the chance to almost have that, something was missing. After a while, I had to cross the parkway’s off-ramp near Chain Bridge Road; thankfully there was a crosswalk. The trail dives back into the woods and returns me to the proximity to the river that I had early on. 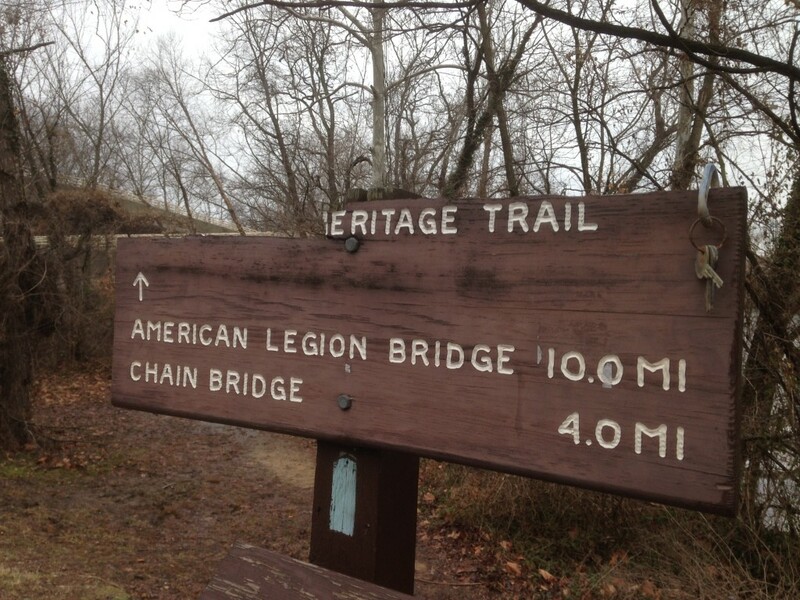 By now, my missteps have cost me enough time that I have to bail out at Turkey Run Park (where you can find restrooms and water), about seven miles in, instead of going the entire 10 miles to the American Legion Bridge, which carries I-495 over the river. 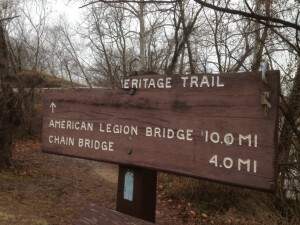 But I’ll be back, to finish this segment and later to explore between Great Falls and Algonkian Regional parks. This article originally appeared in the Spring 2015 issue of RunWashington.